Download "Administration. Avaya Business Communications Manager Find Me/Follow Me. Introduction. 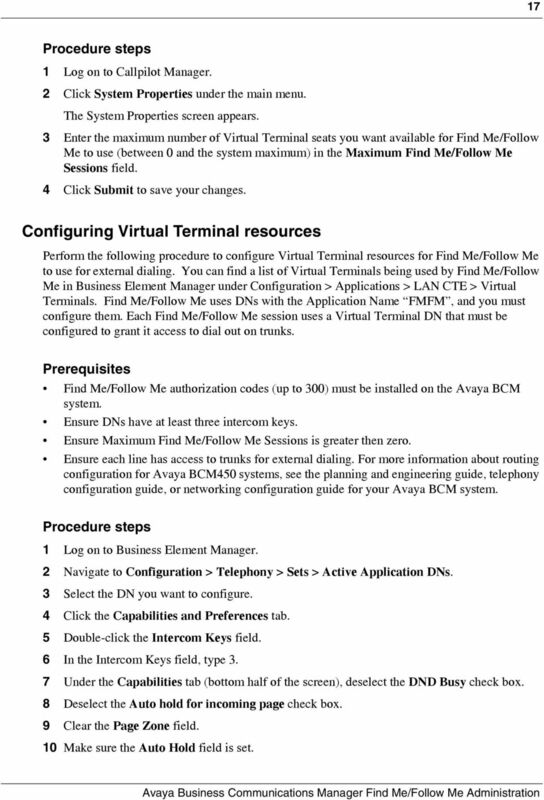 Find Me/Follow Me Fundamentals"
1 Avaya Business Communications Manager Find Me/Follow Me Administration Introduction Find Me/Follow Me allows simultaneous ringing on up to five different external destinations. Users and administrators can configure these destination numbers. 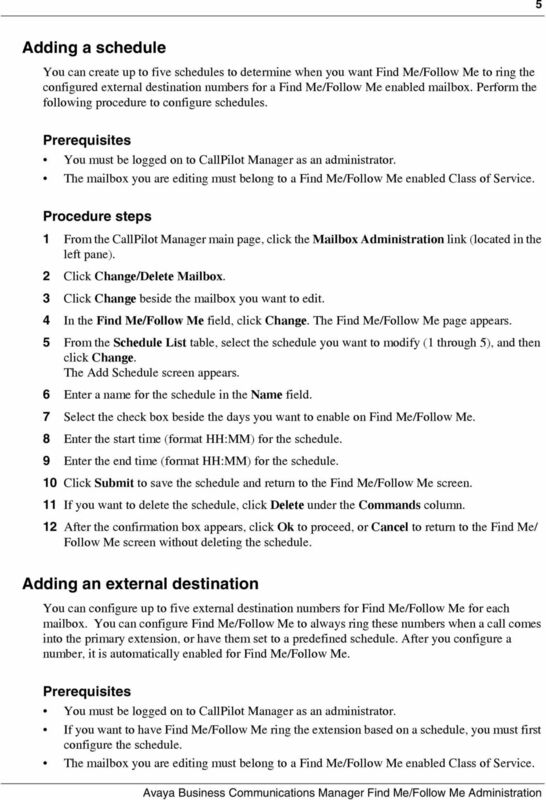 You can configure Find Me/Follow Me based on the time and day by configuring schedules. 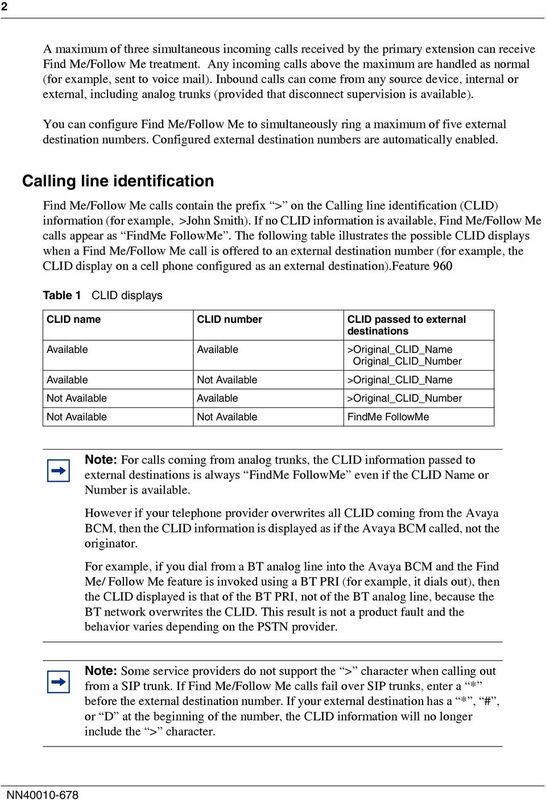 Using Find Me/Follow Me, you can pick up a call either at your primary extension (your desk phone for example) or at one of the five external destinations, such as a cell phone, your home phone, or another phone. When you answer the call at one destination the other alerting calls are disconnected. 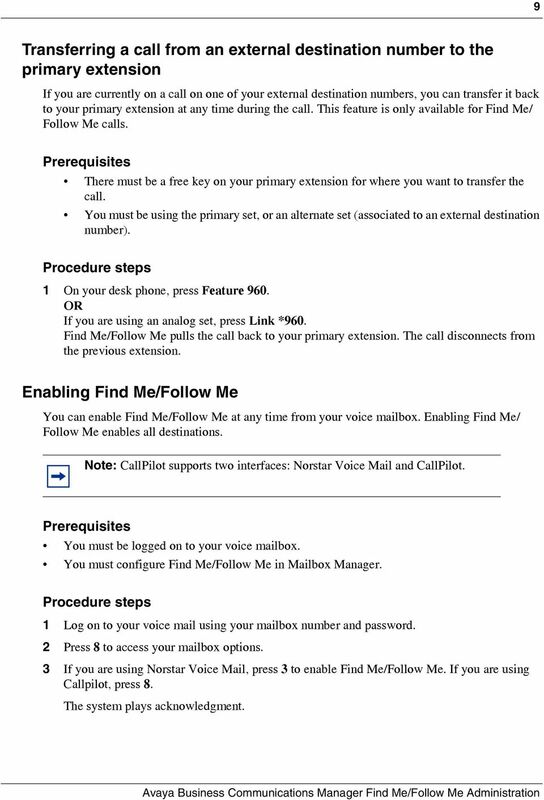 By doing this, the Find Me/Follow Me feature reduces the chance of missed calls. You can then transfer the answered call back. 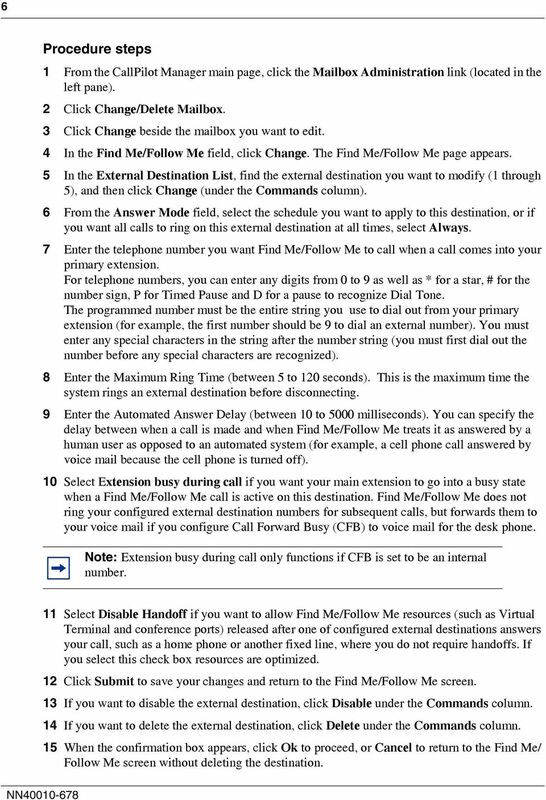 and forth between your desk phone and other devices in your list of Find Me/Follow Me external destinations. 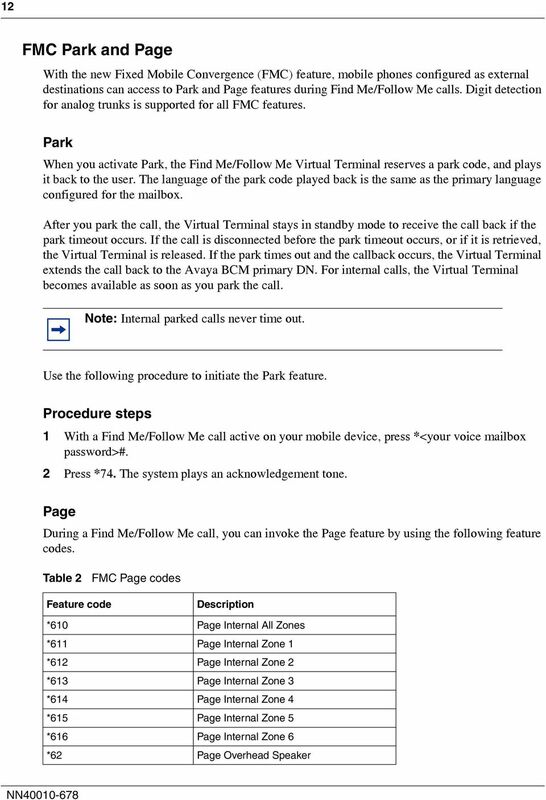 With the Fixed Mobile Convergence Feature (FMC) feature, you can use park, page, transfer, and conference functions on mobile devices configured to be Find Me/Follow Me external destination numbers. 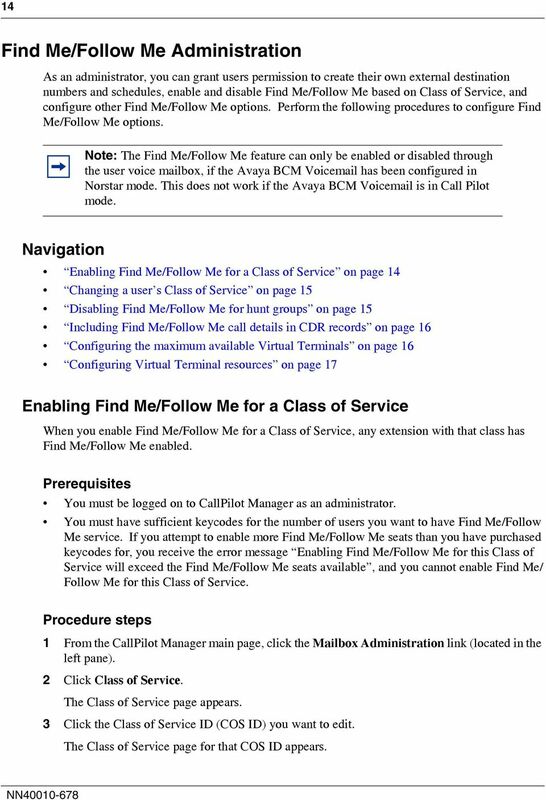 For more information about FMC, see Find Me/Follow Me Operation on page 8. 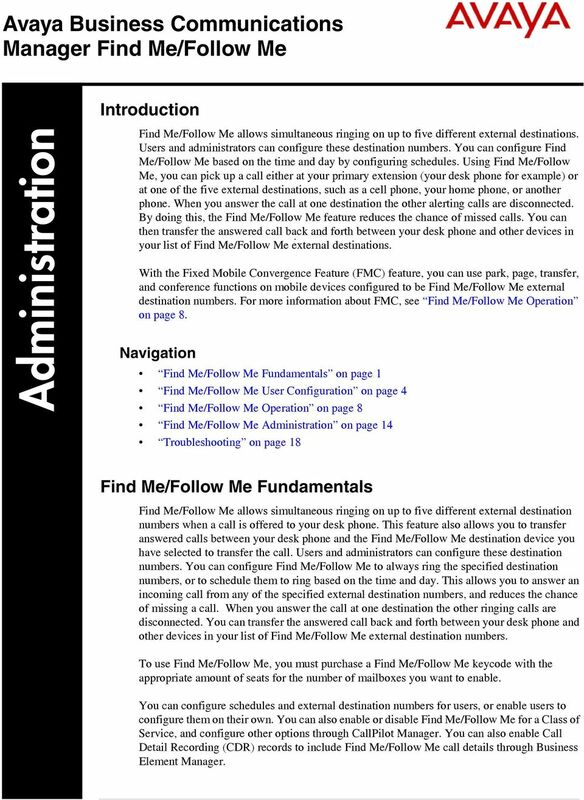 Navigation Find Me/Follow Me Fundamentals on page 1 Find Me/Follow Me User Configuration on page 4 Find Me/Follow Me Operation on page 8 Find Me/Follow Me Administration on page 14 Troubleshooting on page 18 Find Me/Follow Me Fundamentals Find Me/Follow Me allows simultaneous ringing on up to five different external destination numbers when a call is offered to your desk phone. 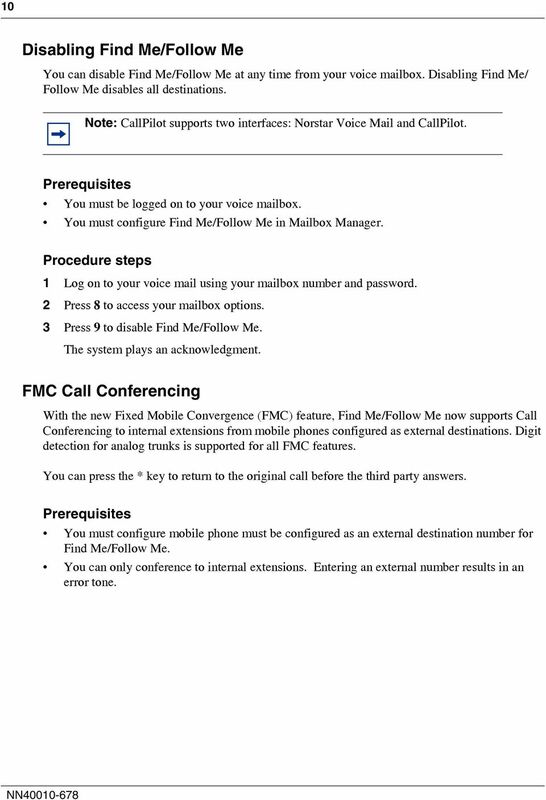 This feature also allows you to transfer answered calls between your desk phone and the Find Me/Follow Me destination device you have selected to transfer the call. Users and administrators can configure these destination numbers. 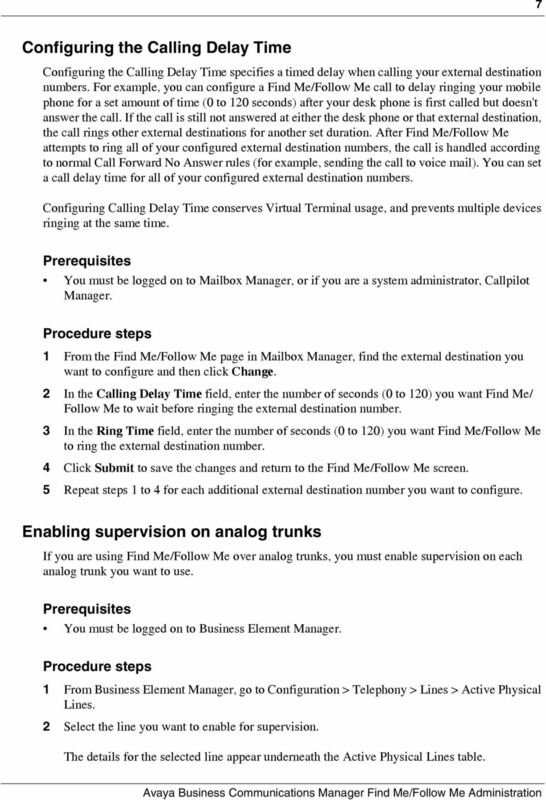 You can configure Find Me/Follow Me to always ring the specified destination numbers, or to schedule them to ring based on the time and day. 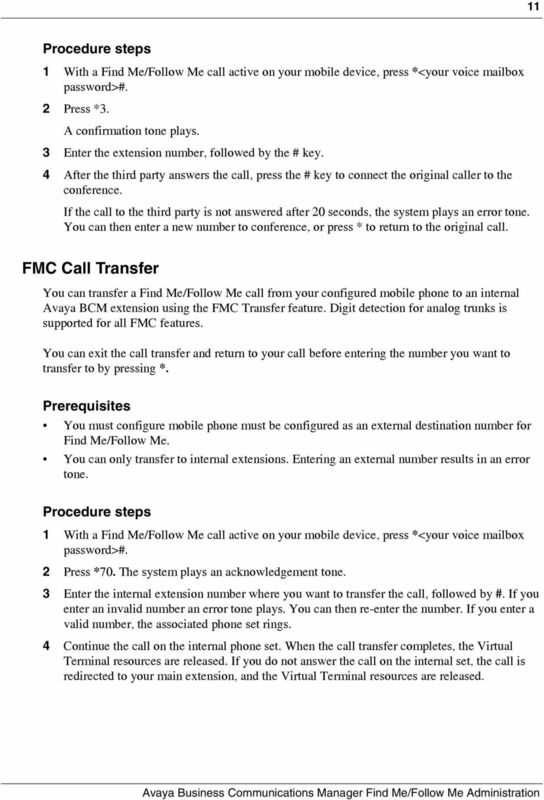 This allows you to answer an incoming call from any of the specified external destination numbers, and reduces the chance of missing a call. When you answer the call at one destination the other ringing calls are disconnected. 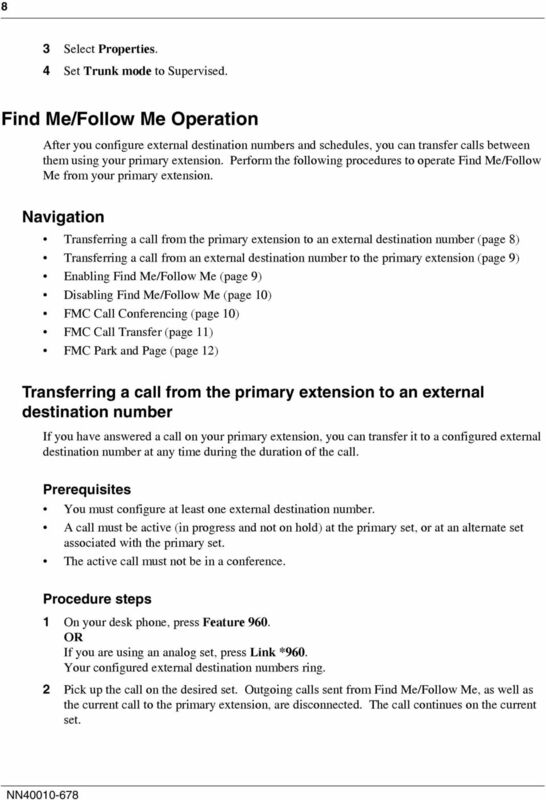 You can transfer the answered call back and forth between your desk phone and other devices in your list of Find Me/Follow Me external destination numbers. 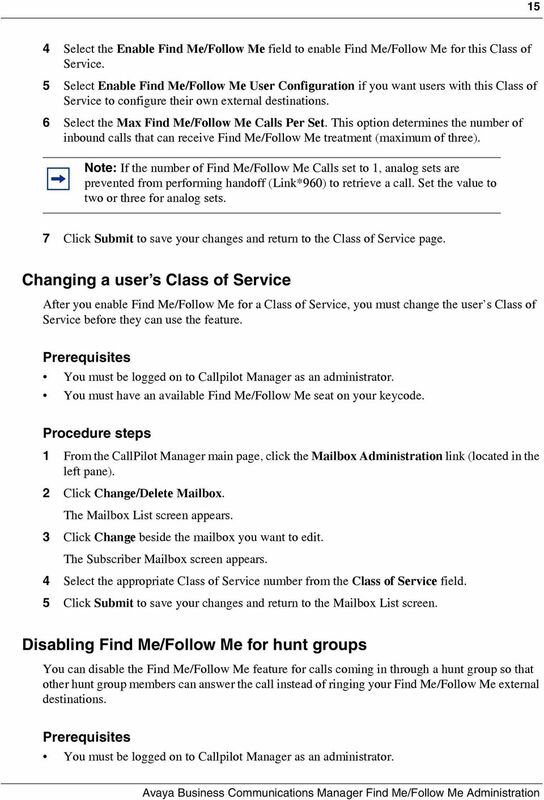 To use Find Me/Follow Me, you must purchase a Find Me/Follow Me keycode with the appropriate amount of seats for the number of mailboxes you want to enable. 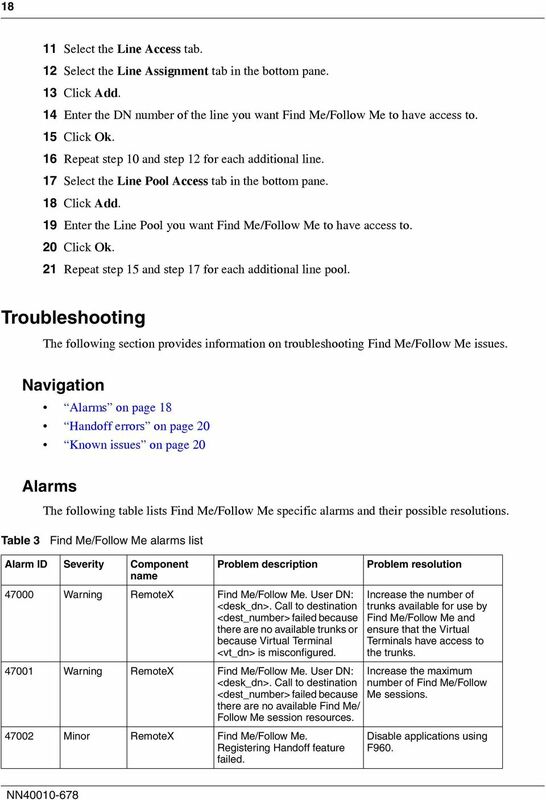 You can configure schedules and external destination numbers for users, or enable users to configure them on their own. 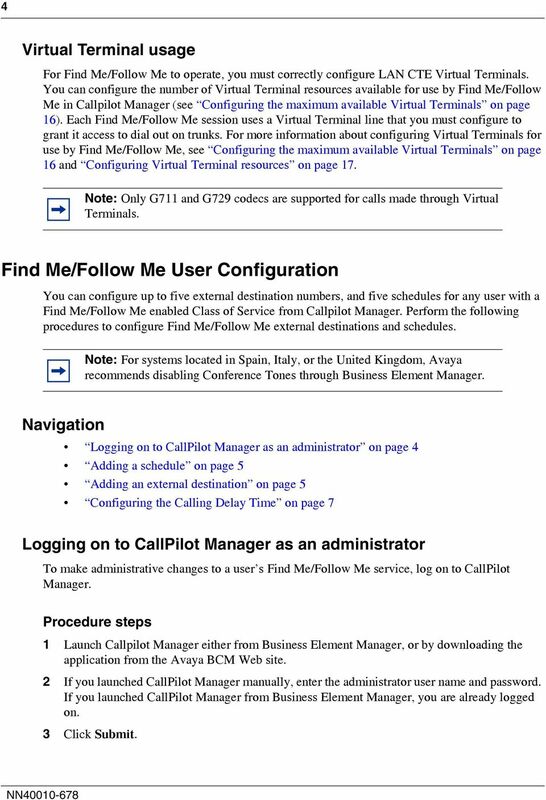 You can also enable or disable Find Me/Follow Me for a Class of Service, and configure other options through CallPilot Manager. 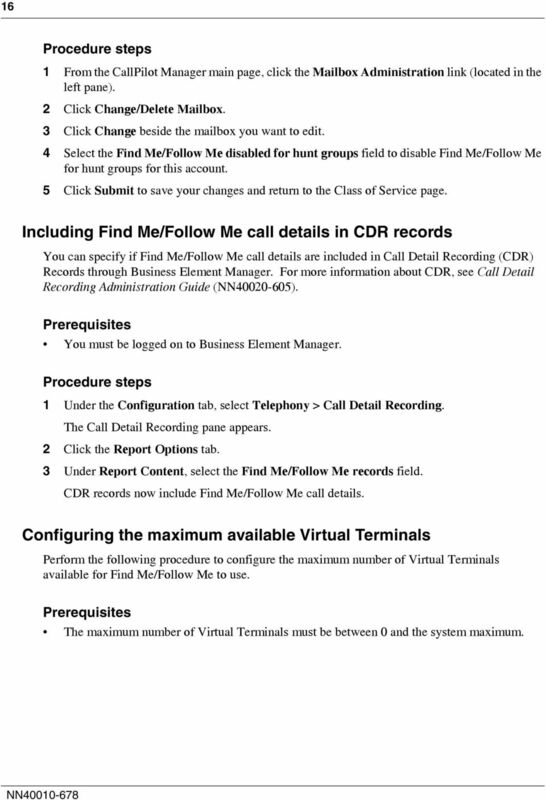 You can also enable Call Detail Recording (CDR) records to include Find Me/Follow Me call details through Business Element Manager. 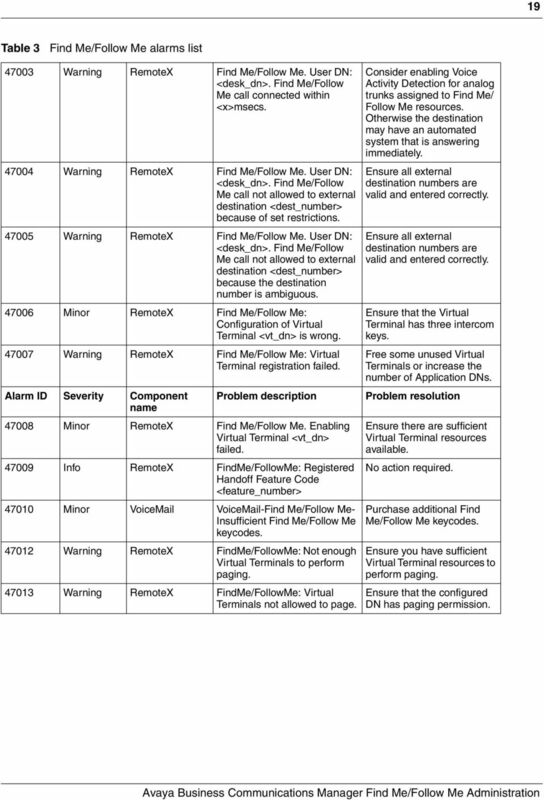 Release 5.0 Document Revision 01.03 NN40170-200 Document status: Standard Document issue: 01.03 Document date: Product release: BCM 5.0 Job function: Type: Publication Language type: EN. All Rights Reserved. 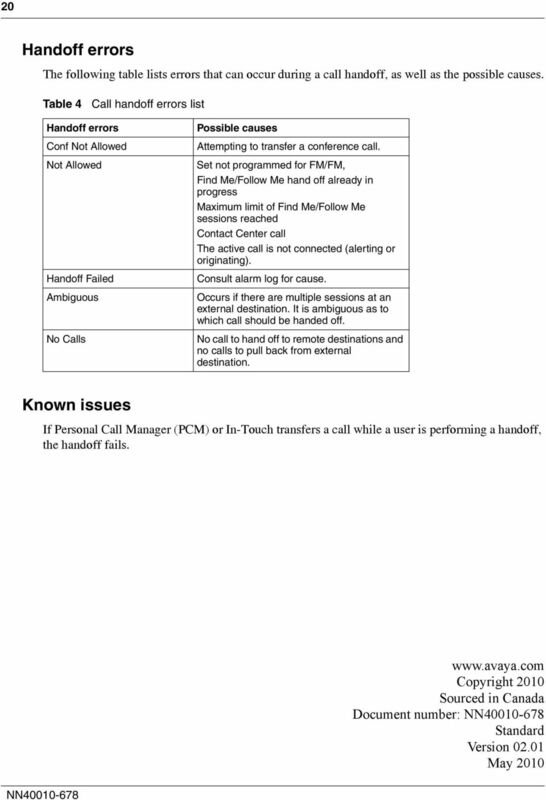 Reports Overview With Fuse Professional you can keep track of the calls made and received by all the extensions in the system. 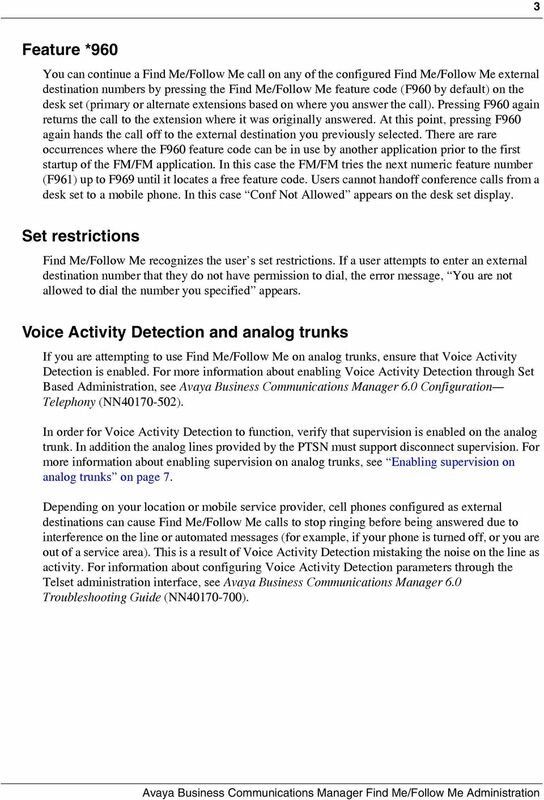 Voice Mail 23 Objectives When you finish this module, you will be able to: Verify that the Embedded Voice Mail (EVM) application can record and play messages. Check the EVM health. Maintain the EVM system. Business Communications Solutions 9910 Irvine Center Drive Irvine, CA 92618 www.bcsconsultants.com [ m ] 949.333.1000 [ f ] 949.333. 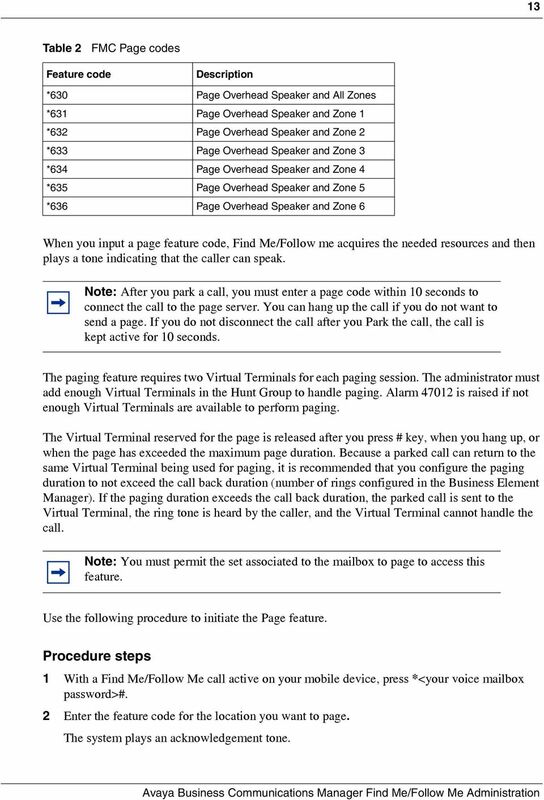 ESI SIP Trunking Installation Guide 0450-1227 Rev. B Copyright 2009 ESI (Estech Systems, Inc.). Information contained herein is subject to change without notice. ESI products are protected by various U.S.